Reflections is created by light designer Silla Herbst, as a further development of the Color Me Up installation from 2011. 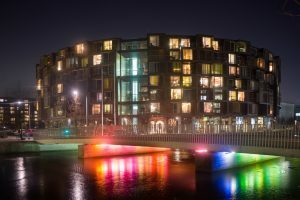 Here, Herbst, in collaboration with Illumenarts, created a composition of multicolored fluorescent lamps suspended on the a railing of a bridge. This created some magical color and shadow effects on the sidewalk. In Reflections, Herbst also works with nuanced color mixtures. With the installation Herbst focuses on the indirect light and materiality in relation to this. 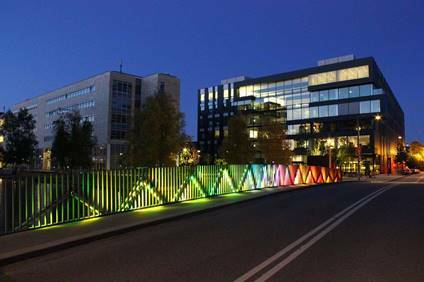 The result is a subtle expression that invites visitors and the user of the area to discover the effect of the reflected light on the bridge’s pills, the space underneath the bridge and the dynamic play of the water with the many colors. 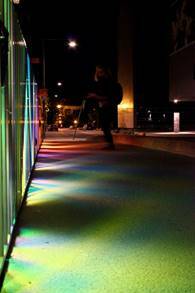 Go for a walk in an Ørestad Nord where three installations light up the district.